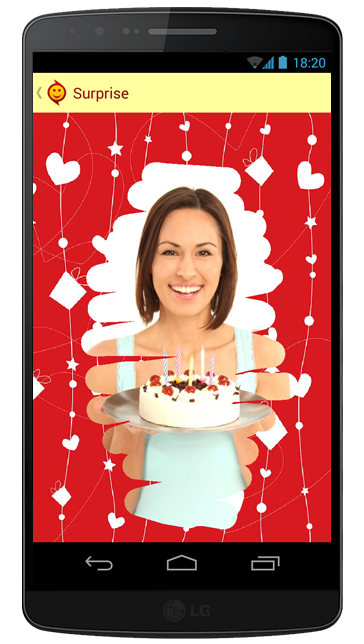 A mobile messenger whose mission is to bring your friends joy! aJoy is a channel to send interactive and cool content. Surprise and entertain your friends with personal attention. 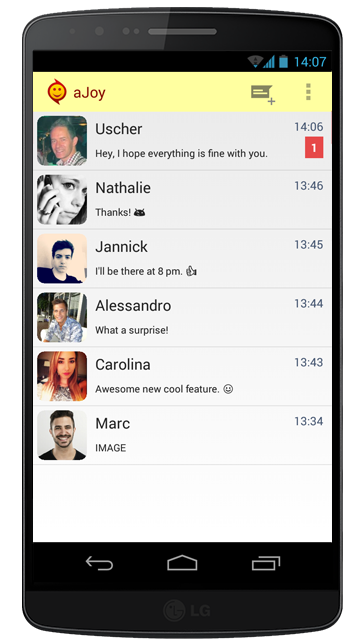 aJoy is a fun and independent live messenger for private messages and group chats. aJoy can send interactive and cool content. aJoy uses encrypted communication and does not collect any data from you or your friends. Download aJoy for free, and use it without any further costs. 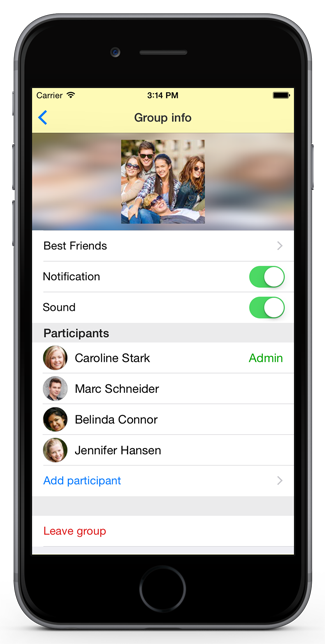 Chat private or in groups with your friends, even if they have not joined yet. Send and view any pictures or videos. 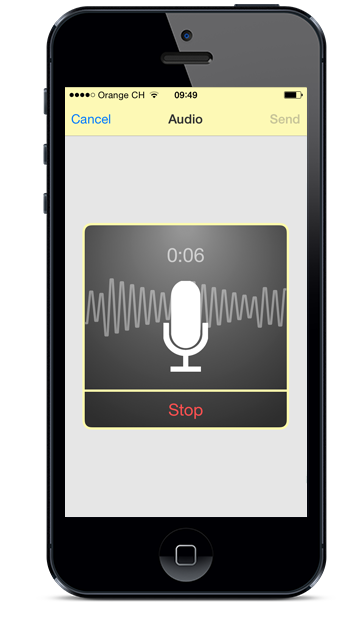 Record a voice message and use funny audio effects. 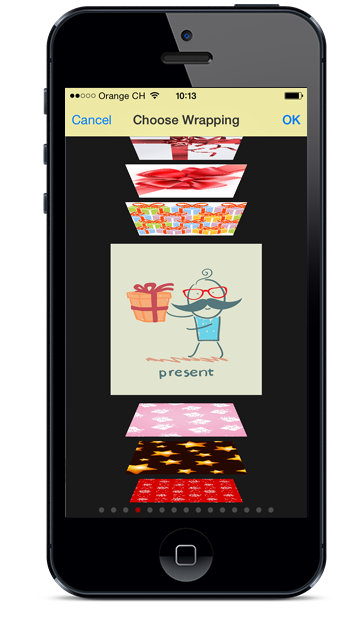 Wrap up your message and let the receiver scratch off the present. 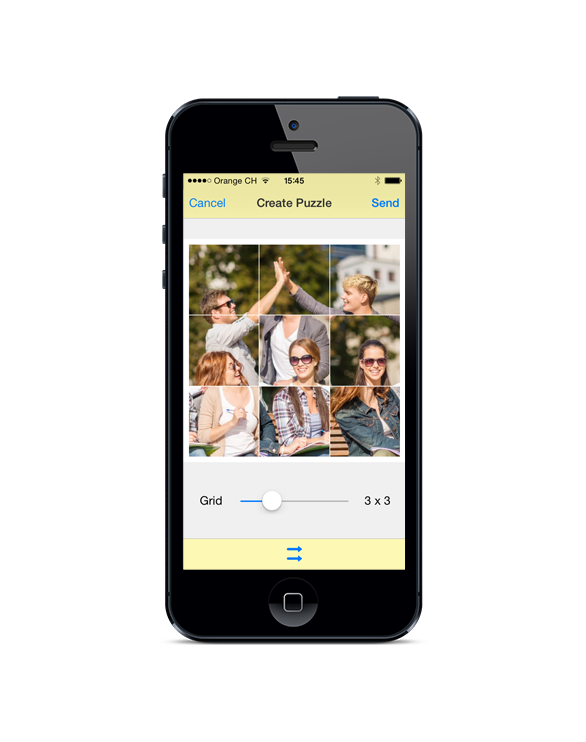 Entertain your friends and send puzzles created with your own pictures. aJoy can be downloaded and used for free. 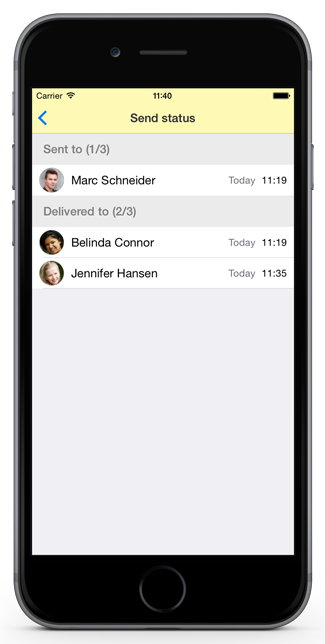 Communication encryption ensures the confidential handling of your messages. aJoy does not observe or evaluate any of your activities. No data is kept on the server. Your data is stored with you locally. Stay tuned and discover new, upcoming features! The app and its services are free until further notice. On which devices can I use aJoy? Where is the profile name used? The profile name is shown in push notifications. It is also shown if the receiver has not stored you as a contact. I got a new phone number or a new device. What should I do? In both cases, all conversations are lost. You simply uninstall the app. Since the server does not keep data, all information is deleted at that point. Server-side, long-term data storage is only for required registration data and profile picture. In general, no data is collected. Messages are deleted from the server as soon as they are delivered. Common safety precautions are applied in order to avoid unauthorized data access. 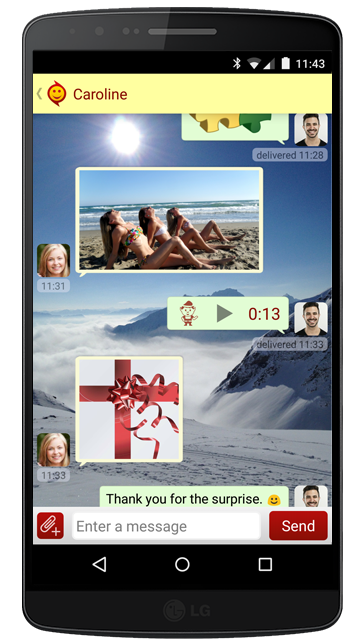 Encrypted message transmission is used to ensure the confidential handling of your messages. Also, certificates and protocols protect from man-in-the-middle attacks and guarantee data integrity and authenticity. Why does aJoy need my number and want access to my address book? Your number is used to identify your account. This ensures that only your device can connect to your account. The numbers of the address book are only used to detect other aJoy users. This data is not stored or passed on by the provider. 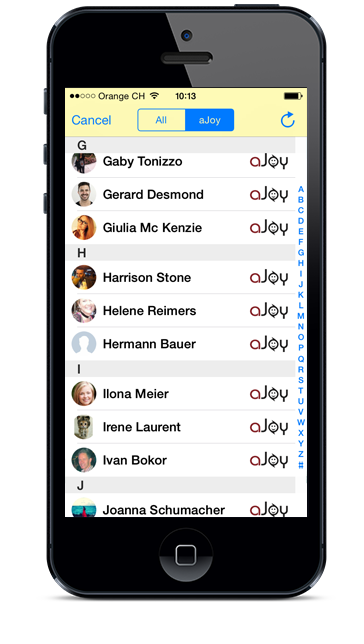 aJoy contacts are periodically synchronized with your address book contacts. The synchronization can also be triggered manually by tapping the sync icon. Based on changes in your address book, new or changed contacts are edited and removed contacts are deleted. This means that if a contact is deleted in your address book, they will also disappear in aJoy, along with all of your conversations with that contact. Can I write to a contact who does not have aJoy installed? Yes! You can send aJoy messages of any kind to a contact who is not yet registered. The receiver is then informed by an SMS to install the app in order to read the message. Save your friend to the address book. He/she will then be automatically added to the aJoy contacts. Why do some contacts from my address book not show up in my aJoy list? The numbers must start with the international country prefix. The best practise is to use the international format starting with '+'. Example: +447700900129 for a UK mobile number. All iPhone models with iOS 8.0 or higher are supported. iPads and iPods are not supported currently. Just swipe the chat entry to the left and then tap 'Delete'. aJoy does not have access to my photos anymore. You have to allow aJoy to access your photos. 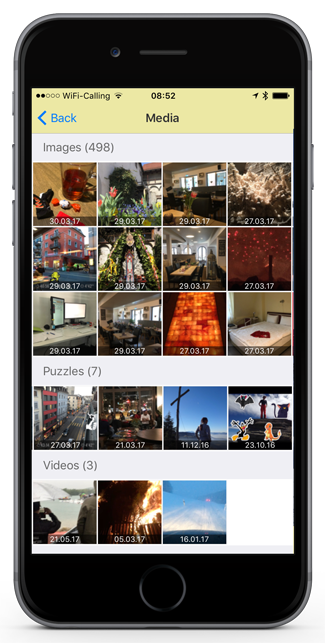 Go to Settings – Privacy – Photos and enable it for aJoy. Push notifications do not work as expected. A push notification appears if a message comes in and the app is in the background. If this is not the case, make sure push notifications are activated in settings. Go to Settings – Notifications – aJoy and activate the options. 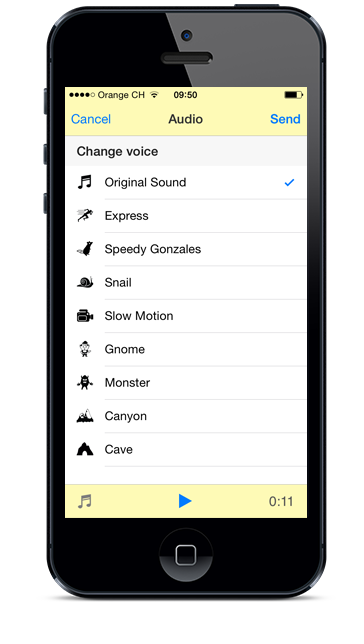 The notification sound volume is set in Settings – Sound. This is also the place to change vibration. If you still do not receive push notifications, then restart the app as follows: Press the Home button twice. Swipe the app's preview up to close it. Restart the app by tapping the icon. Basically all Android smartphones with Android 3.1 or higher are supported. Tablets are not supported currently. Just long press a chat list entry and then tap the Delete icon. Contact us with a message! Please first check for the answer in the Help section and, if possible, use the feedback function in the app.